Over the past several years, blockchain and the technologies based on it – most notably cryptocurrencies like Bitcoin and Ethereum – have dominated much of the discourse in the banking and financial services industries. Largely confined to cryptocurrency enthusiasts and startups until only recently, blockchain is now going mainstream and with it, there is a growing interest in IP protection. 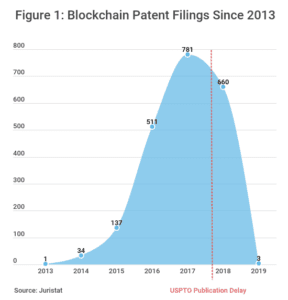 A quick look at patent applications at the USPTO confirms blockchain’s ascendance. As of the date of publication, there are over 2,100 applications containing the word “blockchain,” up from only 34 in 2014 (see Figure 1). 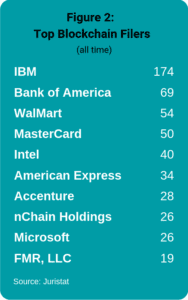 Many of the assignees of these applications are some of the largest companies in the world (see Figure 2). With interest in patent protection for blockchain technologies at an all-time high, companies seeking blockchain patents must act swiftly to monetize their innovations in this rapidly evolving field. Blockchain is a distributed ledger system wherein collections of data (such as transaction records) are stored in “blocks” that are chained together and spread across a vast peer-to-peer network of computers, each of which is known as a “node.” In some blockchain networks, almost every node stores a complete copy of the blockchain. Within the blockchain, each block contains a unique identifier called a “hash value” along with a copy of the previous block’s hash value, thereby forming an unbroken numerical chain of blocks. When a user (“A”) wants to initiate a transaction with another user (“B”), he or she sends a message to the network stating, for example, “A sends five Bitcoins to B.” Each node will then reference the existing chain of transactions to confirm that A has the necessary funds to transfer to B. If a sufficient number of the nodes in the network reach a consensus that A has the necessary funds based on the copy of the blockchain available to them, the nodes will add the transaction record to the current block. The principal advantage of blockchain over traditional centralized ledgers, such as those used by banks, is that distributed ledgers are generally more secure from attacks that would otherwise be made against a central system. Because copies of the blockchain are stored across thousands of nodes that must reach a consensus before completing a transaction, a hacker would have to attack a statistically impossible number of the nodes in the system to successfully insert a fraudulent transaction into the blockchain. Blockchain networks like the one underlying Bitcoin have grown so large that this type of attack is infeasible. All information in the blockchain is also encrypted using a system of public and private keys that form a digital signature for each user, making it virtually impossible to hack user accounts. While blockchain is most commonly associated with cryptocurrencies and the financial industry, its applications extend well beyond that. For example, experts in the medical field believe that blockchain could facilitate drug development by making the results of clinical trials more widely accessible. In the legal world, it could streamline the recording of interests in real property and more clearly and immutably establish exactly when and between whom property interests change hands. And in retail, it could optimize supply chain management by, for example, reducing the number of counterfeit goods on the market and improving food safety. With the potential to revolutionize entire industries, it’s no surprise that major industry players are rushing to secure IP rights in blockchain-related technologies. As patent filings begin to catch up to the industry hype surrounding it, some see a blockchain patent war on the horizon. However, before a company can engage in a blockchain patent war, it first must secure a blockchain patent – and that can present a number of issues for applicants. The most serious hurdle that blockchain patent applicants must overcome is § 101 subject matter eligibility and any accompanying Alice rejections, since the USPTO considers most blockchain patent applications to be software and/or business methods. 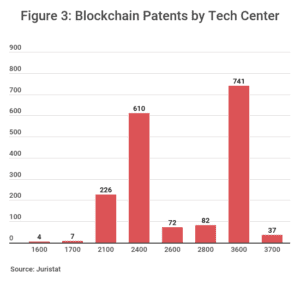 As of the date of publication, a plurality of all patent applications (roughly 42%) containing the word “blockchain” are assigned to Technology Center 3600, which has an average allowance rate of only 67% and contains several art units with extraordinarily high Alice rejection rates (see Figure 3). Section 101 issues may present less of a roadblock for blockchain patent applicants going forward in light of the USPTO’s recently revised subject matter eligibility guidance, but these applicants should presently be prepared for complex § 101 disputes. Blockchain has only recently entered the mainstream, but its origins actually date back to 2008, when an unknown individual or individuals under the pseudonym “Satoshi Nakamoto” published the white paper “Bitcoin: A Peer-to-Peer Electronic Cash System.” In that paper, the author lays out in great detail the groundwork of blockchain and Bitcoin for others to use and copy. Since then, applications of blockchain technology have proliferated, many of which are based upon open-source software – a type of source code that is available to the public to copy, inspect, and alter. The Satoshi Nakamoto white paper and the prevalence of open-source software in this industry both present novelty and non-obviousness issues for applicants seeking patents on core blockchain technologies. Open-source software allows programmers a great degree of latitude in how they use it, but those privileges are not free of strings. Many open-source licenses contain clauses that prohibit the patenting of improvements to the underlying source code or require that any patents obtained be freely licensed. They also often contain copyright notices that obligate users to grant others permission to copy, inspect, and alter their own derivative software, and failure to include such copyright notice in the user’s software could be considered infringement on the underlying open-source software copyright. Applicants for blockchain patents should thus thoroughly inspect their open-source license (if applicable) to determine whether it contains IP restrictions. As with all software-based inventions, obtaining a patent on blockchain technology can be a tricky proposition. This type of patent prosecution requires an attorney with deep technical knowledge, expert drafting skills, and considerable experience handling § 101 rejections before a wide range of examiners at the USPTO. Fish brings together an elite team of attorneys who possess each of these characteristics and more, imbuing our software patent practice with the winning combination of legal knowledge, technical skill, and USPTO experience necessary to safeguard our clients’ most valuable assets. 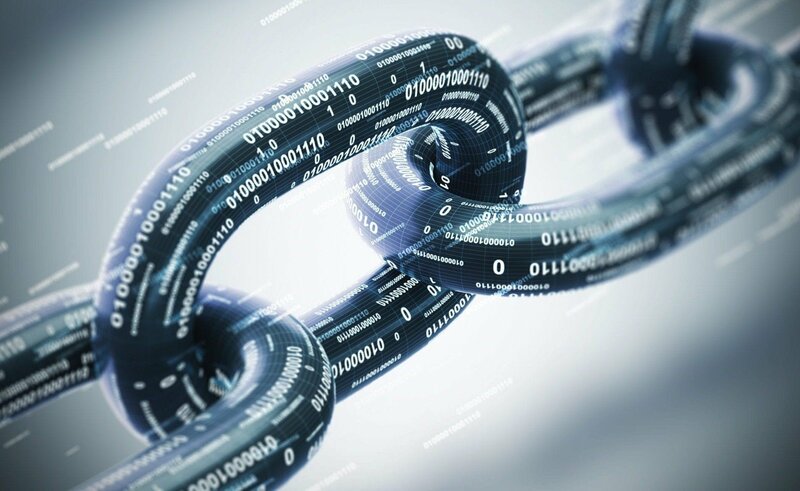 For more information about blockchain patents and our industry-leading software patent practice, contact your Fish attorney or email us at [email protected].